Clydesdales were once used as warhorses in the 17th century. 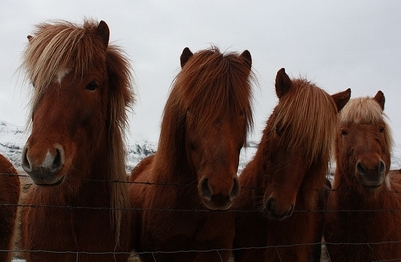 They are named for Clydesdale, Scotland now known as Lanarkshire. 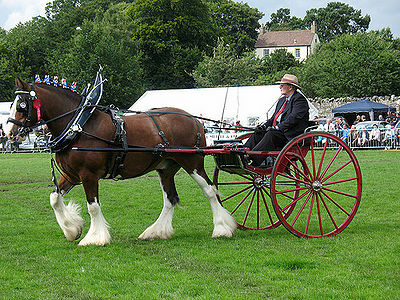 The Clydesdale history dates back over 300 years where it was used as a draft horse on farms. Clydesdales have pulled heavy loads in urban and industrial areas, but are probably best known for pulling Anheuser-Busch beer wagons in commercials. They are company mascots even today. The Clydesdale is a large horse standing over 18 hands, 6 feet tall. It has a large head, small ears, a deep chest and heavy bone structure. In spite of its size, weighing over 2,000 lbs., it is very graceful. It is well known for the long hair covering its ankles. The mane is thick and coat is heavy. 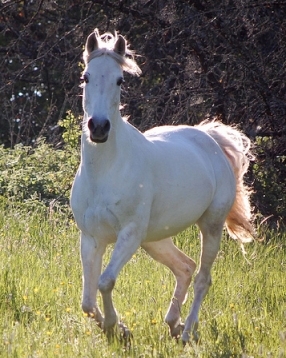 Colors are shades of bay, brown, chestnut and black, sometimes with white feet, a white underbelly and white mask. Clydesdales are intelligent and lively horses. The have become popular as riding horses.